Light has always been an important symbol of Christmas for me. In 8th grade I wrote a short story about a teenage young woman who was having trouble getting into the “Christmas spirit.” No matter what she did, she couldn’t work up the giddiness she used to feel about the season. Then in church on Christmas Eve, during the candle lighting ceremony, she had an epiphany. The warm glow of the lights around the darkened sanctuary reminded her of the Good News of Jesus coming into the world to bring the light of God’s love to all people. The story was a fictional representation of what was in my own heart–and often still is. I don’t get giddy about Christmas anymore like I did when I was a little kid. A lot of the “magic” of Christmas has faded in its importance and impressiveness in my heart and mind. 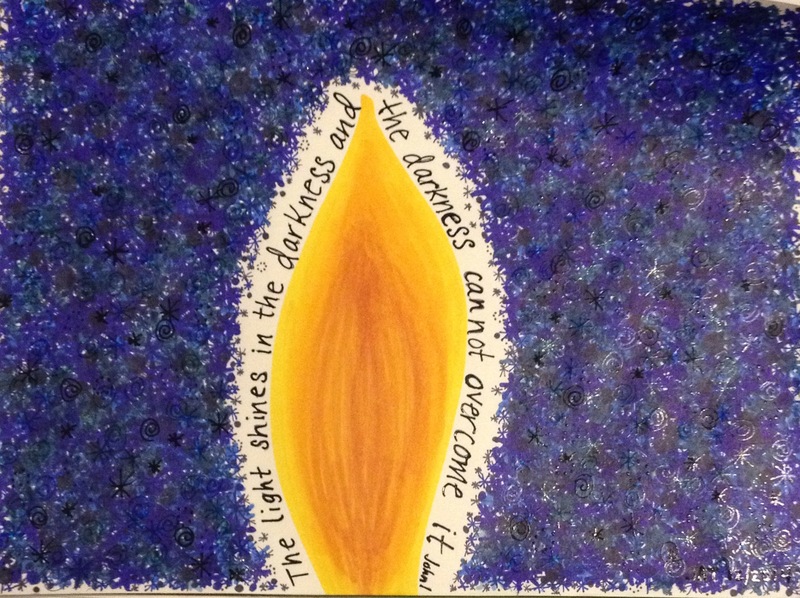 But this news–that God brings light to our darkness–I need that every-always. If I’m going to feel anything special at Christmas, it’s almost certain it will involve light (or gel pens, but that’s kind-of the same thing). During Christmas break in 1994, while I was engaged to my now husband, I got to go as his date to his brother’s wedding in Florida. I was in college in Kentucky at the time and went home to Ohio for Christmas and had my wisdom teeth pulled right after Christmas. I was miserable, but didn’t want to miss the wedding–the first wedding among my now husband and his siblings! My now sister-in-law Angela was from the area where the wedding was, so she had insider knowledge on local attractions. One of the nights we were there Angela wanted to take us all to a Christmas village of some kind. I didn’t know what to expect and my mouth was sore, and I was weary from travel, so I wasn’t even sure if I wanted to go. But I am so glad I did! The Christmas village was this whole lot filled with sweetly painted wooden-facade little houses and buildings. All of the little structures were decorated in lights. You could go up and down the “streets” of this village and see all of the places lit up. I don’t even remember if there was anything distinctively Christian about the display, but the light–Oh! All those lights! They lit up my heart that night and I will always remember the night Angela took us there. To this day, even if I can’t manufacture any “Christmas spirit,” I am filled with hope, awe, and wonder when I see peeps of light at Christmas in candle lighting ceremonies and light displays. There’s something about light shining in darkness that speaks to my heart in a way that daylight or a brightly lit room doesn’t quite do. I often think of my depression as darkness as worries close in on me, and my sense of worth dims. So, I understand darkness all too well. So when tiny lights defy the darkness, I am reminded that God–my God–is bigger than my darkness. Even in my darkness, my God sees me and knows me and loves me. Once again this Christmas, I can’t seem to manufacture that giddy Christmas feeling of my childhood. But the glow of God’s love fills me with hope at Christmas time–and always. May you too know God’s love with a tenacious hope that defies darkness. Mother’s Day is My Day? Posted by Jennifer Clark Tinker in Family. Tagged: Depression, Infertility, Life & Liberty, Mother's Day, Parenting. Comments Off on Mother’s Day is My Day?